I’d guess that if I were a “professional historian,” studying the past would consist of the finer points of “what happened,” and “why,” not to mention “who,” and “when.” Not being a professional, studying history on some occasions, I have to take “some very large steps back,” and before I can even begin to breakdown the acute aspects of time, I have to begin with a more fundamental question; was “this event,” or person actually real, or is “this event,” or person just complete fiction? Sometimes I’m not sure to begin with, and I suspect I’m not alone. Does all of this seem like too much far-fetched nonsense; even for this blog? It might not be. How about an example from the other end of the spectrum? “Some” say Jesus Christ was one of the most magnificent men to ever live. “Others” might say no such man ever existed…..ever! That’s quite a discrepancy in religion, faith and culture, and the possible underlying crux of a problem here on earth that may ignite World War III. Let’s hope not. So where is all “this” going? It’s just some of my random blog thoughts on history, and the problems I see with it. Let’s look at Avalon and Babylon. Avalon was first described by English writer Geoffrey of Monmouth in a book entitled “History of the Kings of Britain.” The book talks of King Arthur, leader of the Knights of the Round Table, and the Avalon birthplace where his sword Excalibur was forged. It seems to be a very popular theme on TV these days; The Librarians, Merlin, Arthur and a few others. Babylon was considered one of the most historical ancient cities of Mesopotamia. It was a cultural and religious hub of the region. 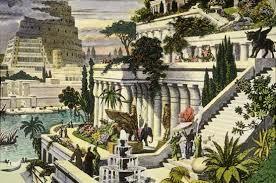 It thrived with trade and architecture, including the Hanging Gardens of Babylon; considered one of the Seven Wonders of the Ancient World. What’s the point? Well, many people seem to believe in Avalon and King Arthur; except it was all fiction, not real; fantasy. Meanwhile, Babylon was “very real,” except many people won’t believe there was such a place. Why is this? Because, people WANT to believe in Arthur, and the Round Table Knights (Not the X-Files poster). It’s easy. They were gallant, chivalrous, and filled with equality when they sat at the table, not to mention loaded with honor and charm while they were out rescuing “fair ladies.” On the other hand, Babylon sat between the Tigris and Euphrates Rivers deep in the middle of modern day Iraq. People are confused. “How could this be the same lawless place as the land that gave us some of the first written laws?” A place now filled with chaos, hate, war and terror, known more for roadside bombs than sidewalk cafes? As with most of life, the “truth” is messy. With history, it can be filthy.